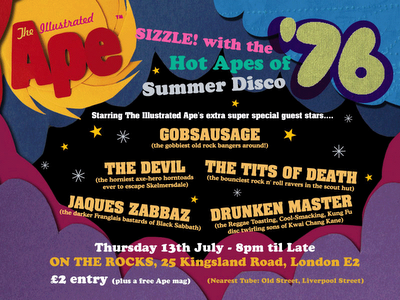 The newest issue of the Illustrated Ape is set to drop and to celebrate the launch of the latest Ape on the theme of 1976 - the UK's greatest ever summer, they are throwing a party at On The Rocks, on Kingsland Road, London E2, this Thursday the 13th July. Entry on the night is only£2 and this also geets you a free Ape mag!! Bring your friends and dress like your mum and dad.